Free shipping quotes in seconds, no hidden fees! Compare air and sea freight in one quote, today. Are you a first time importer? Are you a first time importer? Do you find yourself unsure on how to process your goods? At lost on how to begin? We have good news for you. Our over 20 years of experience allowed us to gain extensive knowledge on how to import goods from overseas into the USA. What’s in the import shipping terms? What’s in the export shipping terms? How do I work out duty rates? For a summary of sample chargeable freight calculations for air and sea, download the PDF. Feel free to call us toll free at 1-877-901-2004 for help. What are included in the import shipping terms? The table below shows what are included in each of the four basic import shipping terms offered in the online freight quote calculator. Ex Works – This is an INCOTERM term of sale (known as “EXW”) in which the buyer is responsible for delivering the goods until they are within the premises of the factory. FCA – This is known as “Free Carrier.” It is the new term to replace FOB; however, many suppliers/forwarders still refer to it as FOB. FOB – This is an INCOTERM of sale known as “Free On Board.” It is where the seller of the cargo is responsible for all cargo transportation costs until its arrival on board the ship. It includes all charges of carriers or forwarders levied at the port of loading. What are include in the export shipping terms? 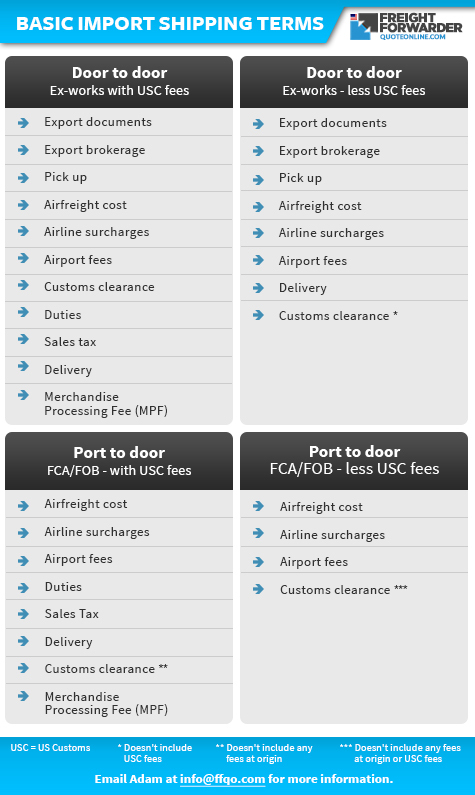 The table below shows what are included in each of the export shipping terms offered in the online freight quote calculator. Note that insurance is not included in these terms. However, we can provide it upon request. CFR – A term used to indicate the cost of the goods and freight charges included in the quoted price. This is also known also as “Cost and Freight” and “C & F”. 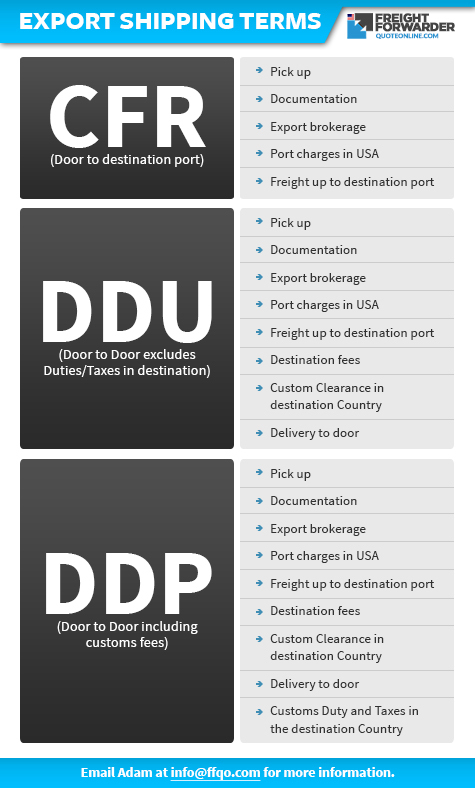 DDU – This is the term for “Delivery Duties Unpaid”. DDP – The term for “Delivery Duties Paid”. FOB – This is an INCOTERM term known as “Free On Board.” Here, the seller of the cargo is responsible for all cargo transportation costs until it is loaded onto the ship. It includes all charges of carriers or forwarders levied at the port of loading. CIF – This refers to the direct copy of the CFR; however, it includes insurance. How to work out duty rates? The table below is a guide showing the top 10 types of commodities, their country of origin and duty rate. Feel free to call us at 1-877-901-2004 if you need help with working out the correct duty rate for your shipment. Note the above duty rates are estimates only based on general products and should not be used for costing without confirmation from a friendly Freight Forwarder Quote Online (FFQO) team member. FFQO cannot and will not be held liable for any inaccuracies of information. Why are air freight rates so volatile? How do I pack my items? How long will it take before my airfreighted goods arrive? How long will it take before my shipped goods arrive? What documents do you need to move my goods? Where do you frequently freight cargo to and from? Who will pick-up my items? Do you move dangerous goods? How much duties, taxes and quarantine fees should I pay? Freight rate varies due to many reasons. The main factors are space availability, fluctuation in fuel pricing, currency adjustments and routing of carriers. Payment varies depending on the mode of freight you choose. Click here to read what you have to pay. You can supply your own insurance. However, we do offer insurance and can include it in your final invoice. We charge a minimum of $85.00 or 0.3% of the product value if it is greater than the minimum. We recommend you use bubble wrap and paper or cardboard to ensure the safe travel of fragile products. The use of timber for packing requires the timber to be treated. Although some exceptions may apply, such as the use of plywood, it is best to check with us if you plan to use timber for packaging. In most cases, your cargo will require one (1) day at origin and one (1) day at destination to pass through customs. Depending on whether the plane carrying your cargo is a direct flight or not, travel time could vary from two (2) to six (6) days. In most cases, sea freight will take four (4) to six (6) weeks depending on your choice of routing. Goods freighted via East Coast can take longer depending on origin port. What documents do you need to import my goods? Read more about the five essential things for customs clearance for better understanding. Depending on the type of goods to be transported, you may need a test report, import permits, or certificates. Contact us if you have any questions. But we do cover over 40,000 locations overall so contact us if you have any specific location you have in mind. Who will pick up my items? Yes, dangerous goods can be moved without too much difficulty; however, the rates vary significantly from product to product. Supply us with your Material Safety Data Sheet (MSDS) from your manufacturers and we could handle it from there. This is not a simple question as there are many factors involved. Talk to us and we’ll be happy to assist you with it. Call us toll free on 1-877-901-2004 or send us a message via our online contact form if you have any more questions.